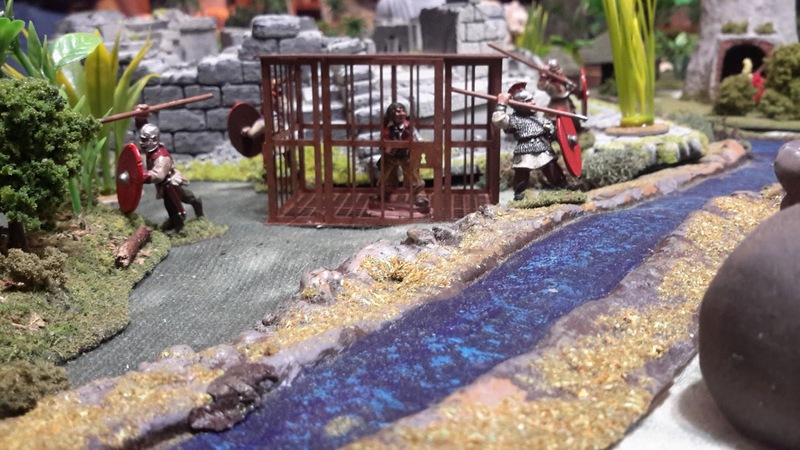 Ghost Archipelago Campaign Game 3 – Drichean Cages | H.A.W.K.S. The lyrics bounced around in my head as we were preparing for our next Ghost Archipelago Campaign Game, the second one in the rule book titled: The Drichean Cages. We ended up with five of our regular players plus one guest. We placed three cages containing prisoners down the center of the table, placed treasures, and then drew for starting positions. I was able to select a corner position which would give me at least one protected flank. Across from Skorri was Heritor Griffin, to the right was Heritor Herndon, and diagonally to the right was Heritor Kragmar (guest player). Further down the table were Heritor’s Gregorious and Fortrywn. “GRIFFINNNNNNNNN!!!!!! !” Skorri bolts upright in his bed and immediately feels the pain in his head from his encounter in the jungle a few….not even certain how many days ago it has been. He can tell he is on board his ship and that they are under sail. Other than that, he is not sure how he got back to the ship, nor the status of his crew. His hand went to his head and he could feel the bandages wrapping his head, as well as a steady throbbing pain. Skorri laid back down on the bed and ran through the events that led to him being here……. The sky was clear and a gentle, salt-laden breeze was blowing from the southeast. Waves lapped gently again the hull of the ship as it pulled against the anchor chain. Skorri and his crew climbed down into their boats to head to shore, once again following obscure passages written on moldy and decaying scrolls. Hopefully this will be a productive exploration. Anemone was busy praying to the Goddess of the seas and casting a few coppers into the water as a small sacrifice for good luck. The boats slid into the white sand and the crew members nimbly leaped ashore. Skorri consulted with Kukala and they quickly obtained their bearings. Today’s target was the rumored location of a map stone near a large waterfall. 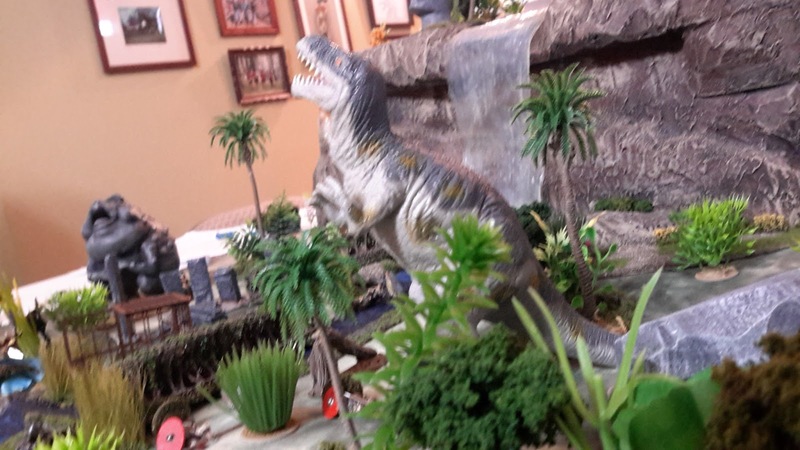 Of course the rumor included the usual tale of a large beast protecting the area. 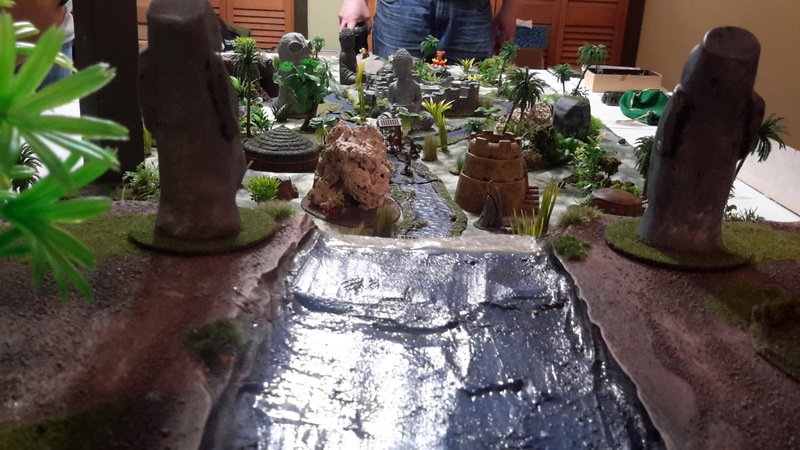 With Kukala in the lead, the crew headed into the jungle. 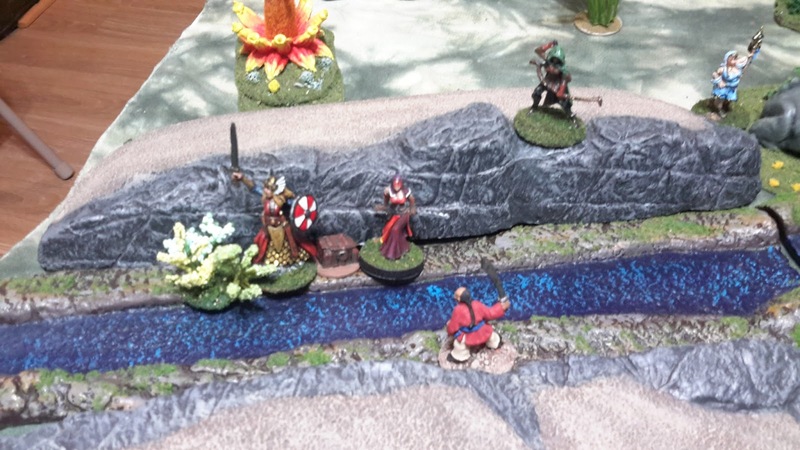 After an hour of hacking there their way through the thick jungle underbrush, the crew emerged near a small stream. Far off to the right, a majestic waterfall could be seen. Immediately to the front, about 100 meters away, four Drichean warriors can be spotted. 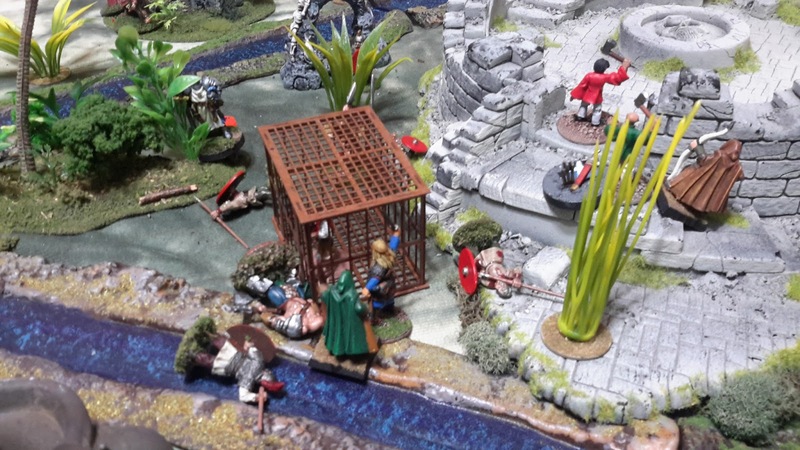 They appear to be guarding a small cage containing a prisoner. From the way he was dressed, the prisoner appears to be crew member from a sailing ship. A quick conference was held and Skorri decided it was worth the risk of freeing him to see if he had any useful information. After moving slowly forward, Amras and Amrod find a good spot to snipe at the guards. 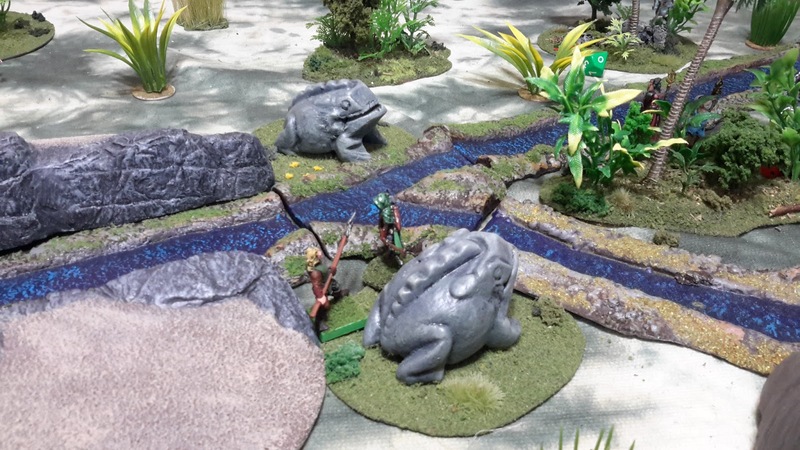 They both take aim at the nearest Drichean guard and let fly their arrows. The guard is hit hard and falls to one knee, surveying the surrounding jungle looking for his assailants. The other members of the crew move forward through the heavy brush trying to keep in cover. 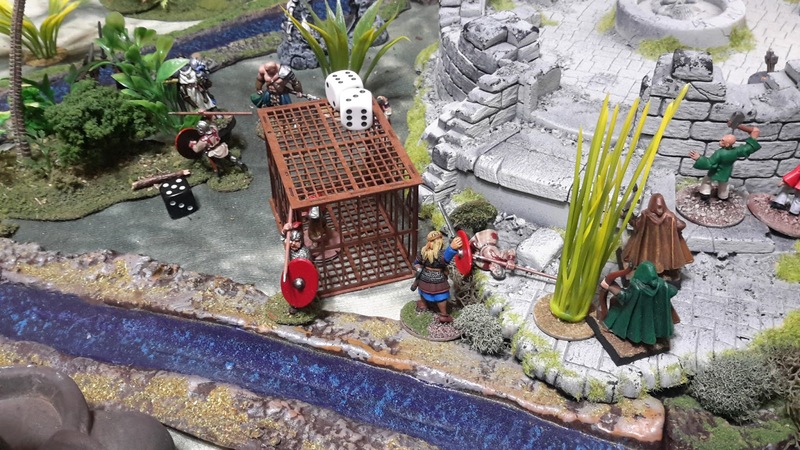 Skorri notices movement in the brush behind the cage. The way they appear to be sneaking up and keeping hidden makes him think its another crew, probably thinking of freeing the prisoner as well. His thoughts are confirmed as he sees several arrows flying towards the Dricheans. Further back in the brush, Anemone decides her talents aren’t needed yet. She thinks it would be helpful to hinder any other crews who might be in the area today. Anemone calls forth to the denizens of the jungle and successfully casts Beast Cry. Blue Boy spots something laying in the brush and rushes forward to check it out. It turns out to be a small chest which he quickly picks up and places in his pack. His job done, he turns to head back to the beach. Skorri shoots at a Drichean guard and misses his target. He is angry with himself and feels his blood burning as he Surges to shoot again – and once more misses. Kukala and Amrod fare no better as both of their shots fail to hit their mark. Anemone joins in by casting Wrath of the Waves. The water from the nearby stream rises up towards the Drichean but looses momentum at the end, merely drenching her target without damage. 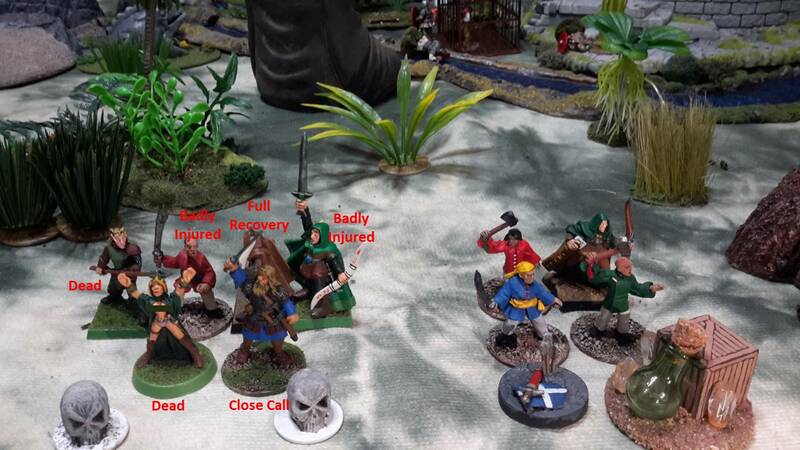 Kukala reels back as he is hit hard by an arrow from Griffin’s crew (11 points of damage – ouch). Off to the left, Chen lee moves forward to contest a treasure. Unfortunately he doesn’t last long outnumbered three to one and Griffin’s crew claims a treasure. The clear, sunny day suddenly starts to darken as low cloud begin to form. Gregorius and his Storm Warden must be nearby (Cloud Cover was cast). Skorri, still angry at himself for failing to hit with his bow, draws his sword and charges forward. He slams into the Drichean guard, spins around and skewers him with his sword. Skorri then turns to face the other guard. 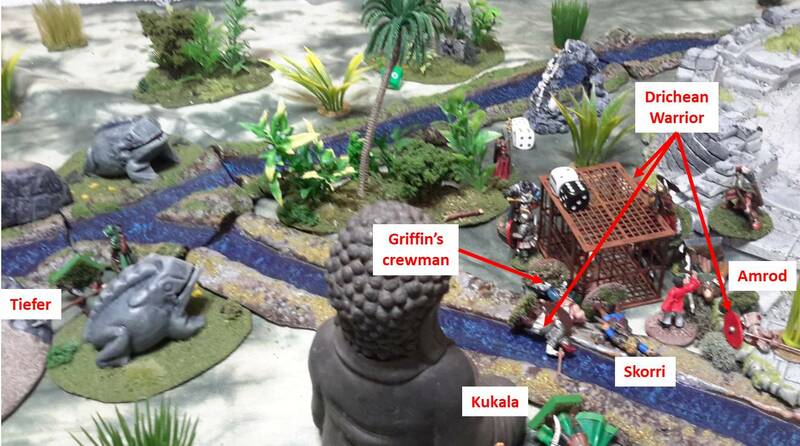 As he moves into better cover, Kukala hastily fires an arrow towards Griffin’s crew but fails to hit anyone. Anemone watches as Kukala pulls the arrow out of his shoulder. She draws forth on her mastery of the power of the waves and casts Water of Life on him. Kukala immediately feels better but is still far from being healed. 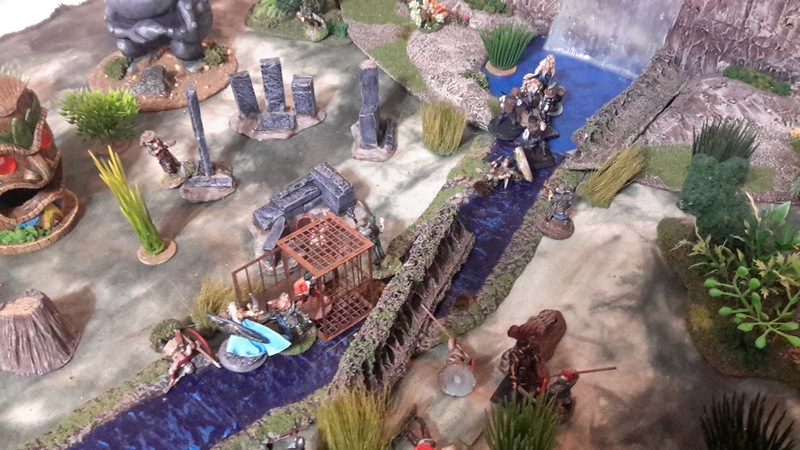 On the right flank, Hat Chet moves into the ancient ruins of an old temple and finds a small leather bag. As he reaches down to pick up the satchel, he sees another crew member he doesn’t recognize climb into the ruined tower. He pulls out his hatchet and signals to Wu and Amras for some support. Fortunately the interloper, seeing Skorri’s three crew members, decide its not worth the trouble and climb back out of the ruins (He was a members of Kragmar’s crew). With their departure, Hat Chet decides it is time for him to get the treasure back to the beach. Skorri didn’t think too kindly of those who fail to properly recover treasure items. The clouds continue to thicken, further restricting line of sight. Skorri moves into contact with the other Drichean guard. A quick series of thrust, feints, and parries ends with the Drichean face down in the brush. Skorri’s feels the hairs rise on the back of his neck as his heritor senses alert him to a spell being cast his way. His blood burns as he activates his Spellshield, immediately putting an end to Griffin’s warden’s attempt to cast Wrath of the Waves. Amrod and Amras both continue their poor shooting form by missing everything they shoot at – Skorri takes note to schedule some target practice time for them. Anemone cast Water of Life on Kukala again. Kukala takes a quick shot at Griffon but the arrow flies wide. Skorri thinks to himself that all of his crew’s arrows must be defective. 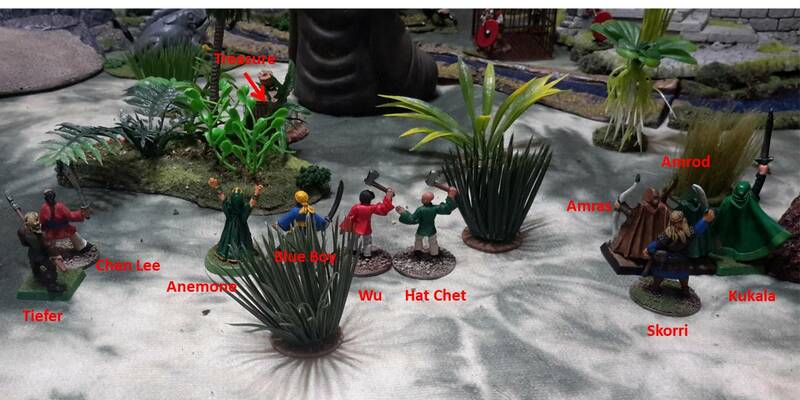 But not those belonging to Griffin’s crew, Chen Lee is dropped with a single arrow to the chest. Amrod finally hits a target with his bow, cause one whole point of damage to Griffin – I don’t think he even noticed. Visibility has been greatly reduced as the clouds thicken once again (Line of sight reduced to 12"). Griffin picks up a huge stone and Hurls it at Skorri. Skorri ducks but the stone still glances off his shoulder causing some minor damage. One of Griffin’s crewmen charges into contact with Skorri. Skorri goes through his thrust, feint, and parry maneuvers but is shocked when he feels the cold steel of the crewman’s sword bite deep into his side (caused 9 pints of damage). Amras sees Skorri is in trouble and charges into the crewman, momentarily distracting him. Skorri takes advantage of this and strikes the crewman in the head, knocking him to the ground. Amras then has to quickly duck as an arrow flies out of the brush. Kukala manages to hit Griffin with another arrow but it simply careens off his breatplate. Anemone had witnessed the Skorri’s fight and the wound he received. Knowing Skorri would be weakened by his injury, she manages to cast Water of Life on him. Skorri turns to thank Anemone. In that same moment, hidden in a clump of jungle bushes, Griffin Hurls another rock at Skorri. He fails to see it coming and the rock strikes his helm with a loud clang. Skorri eyes roll up and he drops to the ground unconscious. 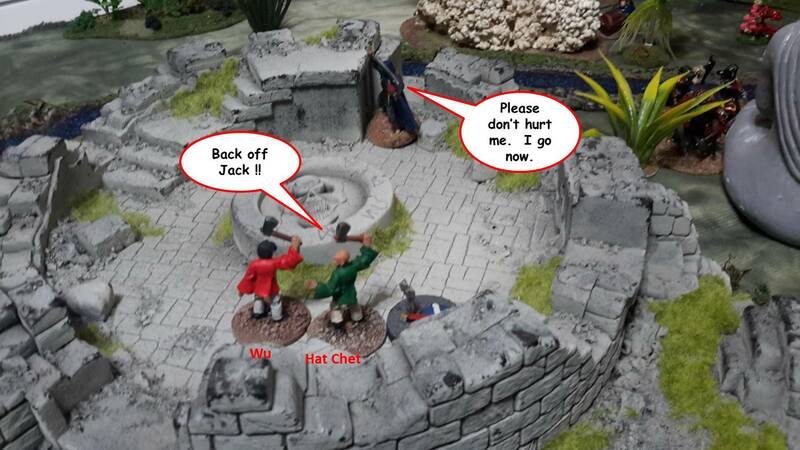 Wu fights off one of Griffin’s crew, inflicting a severe wound to his arm (9 points of damage). Amras is hit hard in the side by an arrow (9 points of damage). Ignoring the wound, he draws a bead on Griffin and with vengeance on his mind, lets an arrow fly. His aim is on target but Griffin is saved by his armor. Anemone, still stunned by seeing Skorri fall, draws upon her anger to successfully call forth the power of the water to strike a fatal blow against one of Griffin’s crew. 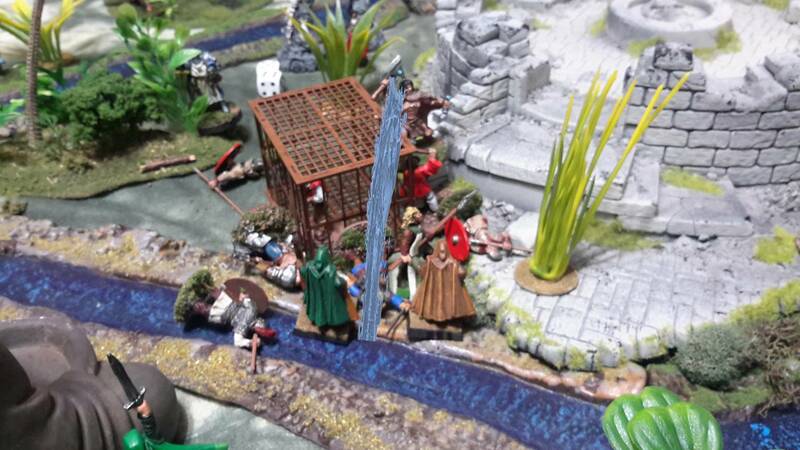 The water rises up and crashes down on Griffin’s crew member drowning him (Successful casting of Wrath of the Waves). 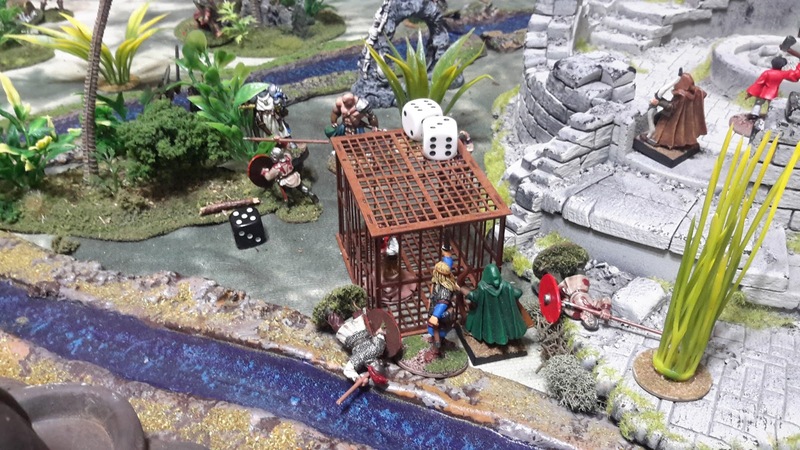 Another Drichean warrior runs out of the jungle and takes up a position to guard to the prisoner in the cage (random creature). The chances of releasing the prisoner had pretty much vanished but the remaining members of Skorri’s crew were not about to let Griffin capture him. Griffin Hurls another rock, this time the target is Kukala. The rock hits his left arm, the shock causing him to blackout. Later, when he wakes up, he finds his arm had been broken. That will take some time to heal (rolled Badly Injured on the Recovery table, will be sitting out the next game). Amras and Amrod return fire but once again they both miss. Anemone casts Water of Life on Amras, pushing it for 5 points of damage (which is okay since she is safely hidden behind cover). Amrod dodges an arrow and is immediately attacked by Griffin’s man-at-arms. The man-at-arms easily bests him. Anemone counters by casting Wrath of the Waves on the man-at-arms but the water dissipates just before it strikes, causing no damage. Anemone watches as Griffin emerges from the thick brush where he had been cowardly hiding. She quickly incants the words for Wrath of the Waves only to have Griffin activate his Spellshield ability and cancel her spell. And while she was concentrating on casting, Griffin’s archer managed to sneak around behind her and fire an arrow. Amras was momentarily in shock as he sees the arrow bursts out of Anemone’s chest, he knew right away she was gone. She fell to the ground in a heap of robes (rolled a “1” for Anemone’s recovery roll). Anemone’s death momentarily stunned the rest of the crew. The roar of the nearby monarch galvanized everyone into action. Griffin and his crew withdrew into the jungle carrying their wounded but leaving the prisoner still in the Drichean’s control. One of Griffin’s crew looked like he was carrying a map stone. Looks like the old scrolls were correct. Amras and Wu rush to Skorri and quickly rig a stretcher. Amrod groggily wakes up. He moves to assist Kukala who is tenderly holding his broken arm. He fashions a suitable sling for him. They all pause momentarily beside Anemone, knowing that she had finished her last adventure. A few silent prayers were said. they then turned and headed towards the beach, and the safety of their ship. They arrive to find Blue Boy and Hat Chet waiting for them. While the crew waited for boats to be rowed ashore, Chen Lee manages to stumble onto the beach before collapsing from a loss of blood. The crew place him in a boat along with Skorri and Kukala and they all row out to the ship. Their heads are hung low in the shame of being beaten so badly. Even the two treasures they managed to recover brought no real joy as Amras realized Skorri’s magic sword was not in his scabbard. There’d be hell to pay for that (Skorri rolled a Close Call on the Recovery chart meaning he lost all items he was carrying). They knew they would lose valuable time sailing back to a port to recover and refit. But none of them would ever forget the name of Griffin. His name was written into the book and underlined twice. Retribution will be had. “We did manage to recover a magic looking helm (Piscian Helmet) and 40 gold coins. Get some rest, we’ll wake you when we near the port,” and with that, Amras got up and closed the door. Tiefer had been slowly moving around to ambush Griffin’s archer. He charged out of the brush, knowing this would be an easy fight. The archer wass startled by Tiefer’s charge. He spun around wielding his bow like a staff. The bow struck Tiefer on the left temple with a loud crack. His knees buckled and his newly acquired sword slipped from his grip (Superior Hand Weapon +1 Fight found during the last game). Tiefer had a look of astonishment on his face as his eyes closed for the last time (rolled a “3” on Tiefer’s recovery roll). What a great game as player’s fortunes waned back and forth! Skorri and his crew got spanked hard with 60% of them out of action. The loss of Anemone will force a return to port meaning some of the few magic items will have to be sold off to make the trip. She will have to be replaced so I have some decisions to make concerning what kind of warden to replace her with. In hindsight, Anemone shouldn’t have pushed that last heal, she would have survived the arrow hit. Anemone’s Beast Cry spell bringing in a Monarch on the other end of the table was great – not so much for Gregorious and Fortrywn but at the other end of the table, everyone was entertained. 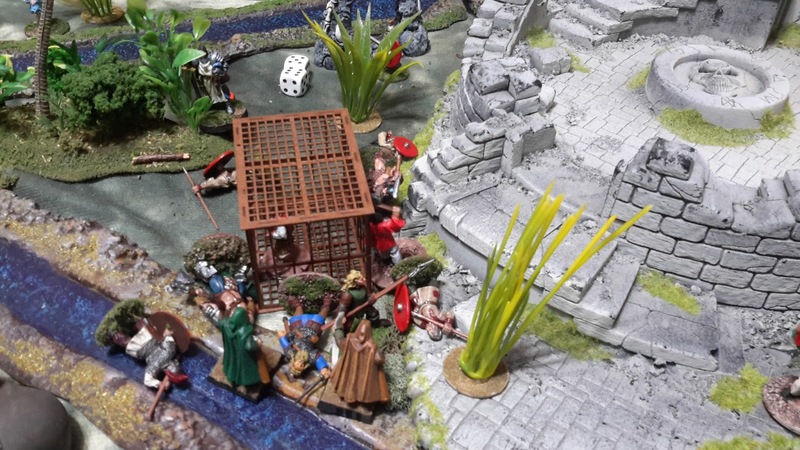 The game was a bit unusual as the six crews seemed to be playing three separate battles, centered on the prisoner cages. Little to no flank action – which was probably a good thing given the number of Drichean guards. 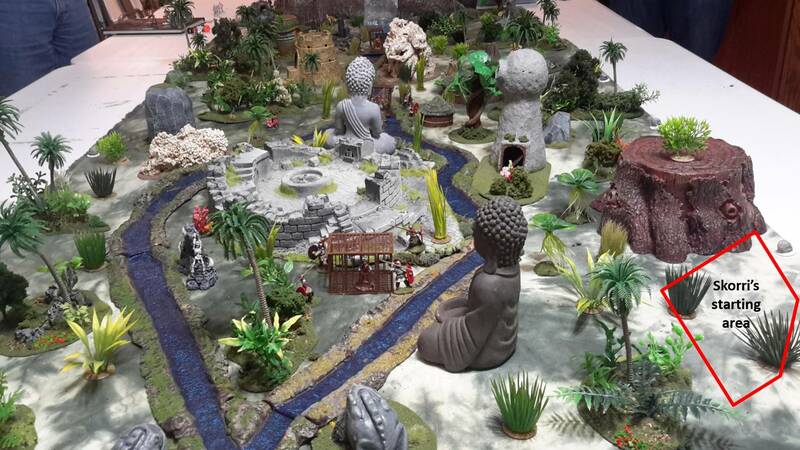 No one managed to get away with a central treasure (the prisoners). Fortrywn came close but between “Hail Mary” crossbow shots and the Monarch devouring Gregorious’ last crewman, he was denied his hard fought over prize. When Skorri heard the story, he got a good chuckle out of the final outcome. Love the big stone frog statues. Yea, those are the ones! Nice find, I thought they were probably resin from some kit!